The exploitation of thallium (Tl) resources through mining poses a significant threat to ecological systems and human health due to its high toxicity and ready assimilation by human body. 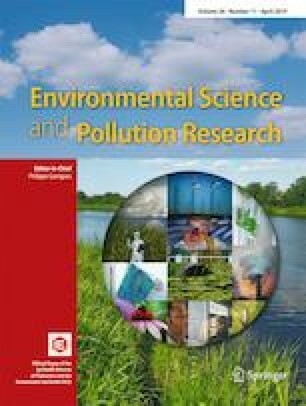 We report the first assessment of the pollution, spatial distribution, source, and ecological-health risks of potentially toxic elements (PTEs) in Tl mining area of southwest Guizhou, China. Spatial distribution maps for PTEs were visualized by ArcGIS to identify their distribution trends. We use the enrichment factor (EF), correlation analysis, and principal component analysis to identify likely sources of seven PTEs mining area. The wider risk assessment was evaluated using the geoaccumulation index (Igeo), potential ecological risk index (RI), human non-carcinogenic risk (HI), and carcinogenic risk (CR). The results revealed the PTEs content in the study area identifies direct mining, metal production, and domestic pollution sources. In addition, the distribution of PTEs was also affected by the topography, rain water leaching, and river dispersals. The main elements of concern are Tl and As, while Cd, Cr, Cu, Pb, and Zn do not show significant enrichment in the area despite associations with the ore deposit. Risk assessment identifies strong pollution and ecological risks and poses unacceptable human health risks to local residents, especially for children. The ecological risk in the study is identified to be predominantly from Tl (74.32%), followed by As (8.57%) and Cd (7.32%). The contribution of PTEs to the non-carcinogenic risk of humans in the study area is exclusively from As and Tl, while the carcinogenic risk is dominated by As, and the other elements pose no significant risk to human health. The online version of this article ( https://doi.org/10.1007/s11356-019-04997-3) contains supplementary material, which is available to authorized users. This work was supported by the National Natural Science Foundation of China (NO. 41472328).